These invitations are so easy, you can make them using nothing but a printer, a paper slicer, card stock, double stick tape, a rubber stamp, and ink. I spent $180 for 150 invitations, 150 RSVP postcards, and 150 envelopes! Nobody can even tell they are homemade! 1. Set up your tabs on your word processor so that you are printing text that fits on a 4X4 square. You can print two 4X4 squares on each 8.5 X 11 piece of recycled material card stock. 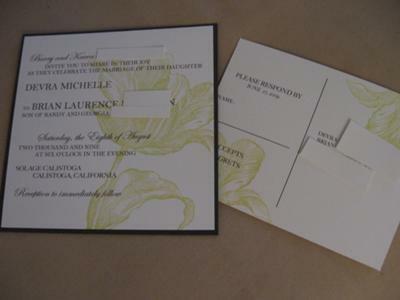 Type the text that you desire on your invitations, alternating between a script and a block font on different lines. 2. 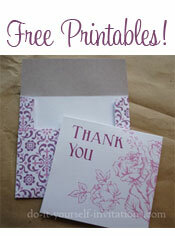 Print out your text invitations using brown ink onto natural white recycled material card stock. 4. 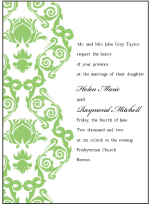 Use a large rubber stamp and acid green ink to stamp a design onto the left hand side of the invitation. I used a stamp by Magenta Stamps called "tulip". The ink was Memento ink in "pear tart". 5. Cut brown recycled material card stock into 4.25X 4.25 squares. 6. Use double stick tape or any other adhesive to mount the white square onto the brown square. I just used scotch double stick and it worked great! 1. set up your word processor to split your 8.5 X 11 paper into 4 equal rectangles. 2. In each rectangle, use the left side to put a line for the guest's name, and a check box for "accepts/regrets"
5. Print your postcards and slice them with the paper slicer. 6. Use the edges of your rubber stamp to decorate the corners of your postcard.